Products made of 100% recycled plastics mix HDPE. Light Duty applications at a very competitive price. Ideal for Export purposes ‐No need for fumigation. 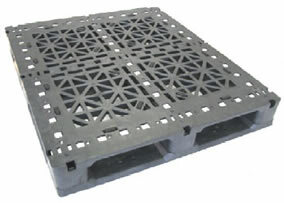 Export One‐way nestable pallet designed for price sensitive user. L" x W" x H" * Dyn. * Stat. * To optimize nominal specifications loads must be evenly distributed to reach capacity. Load construction, support conditions,transportation, load retention, user facility and temperature are factors that affect palletcapacity. High Pressure Injection Molding made of 100% recycled HDPE plastic. Resistant to most chemicals –Sanitary –High residual value. GMA design can be tailored to specific capacity by adding Rods. Meets and exceeds ASTM standards. L" x W" x H" * Rack. * Dyn. * Stat. * To optimize nominal specifications loads must be evenly distributed to reach capacity. Load construction, support conditions, transportation, load retention, user facility and temperature are factors that affect pallet capacity. Cost sensitive users choice for Mid-duty applications. Well suited for the Drug industry and clean environments. 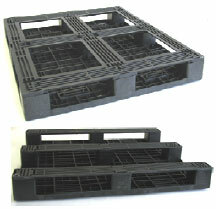 Display pallets are ideal for End of isle, Freezer, Cold Room Downstream order picking. Designed for the Beer & Beverage industry for strong applications. Great for customers using a smaller footprint. Perfect for use in the Beverage industry or other heavy duty needs, compatible with conveyor systems and double stacking. Perfect for the Beer industry to use with four 1/422 or six 1/6 Barrels, can be double stacked. * To optimize nominal specifications loads must be evenly distributed to reach capacity. 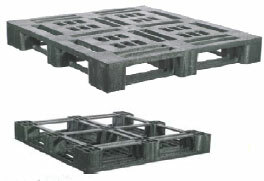 Load construction, support conditions, transportation, load retention, user facility andtemperature are factors that affect pallet capacity. Resistant to most chemicals –Sanitary – High residual value. 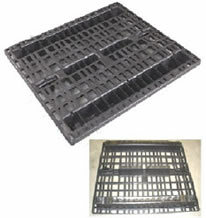 Used in the paper goods and other industries needing a larger footprint and added support. Great for Beam Rack application, the center runners designed aisle alignment and stability. 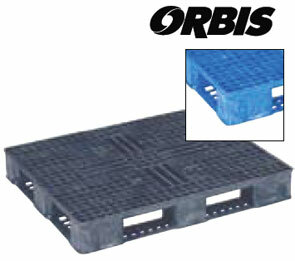 Designed for industries needing a large footprint and added support. Ideal for Dum applications. 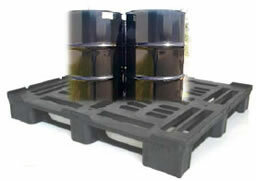 2 Effficient pallets for your products with full 1” Lip for Secure loads with openings for Drum use. Made of 100% recycled HDPE plastic. Moving load capacity of 5000 lbs. Static load of 30,000 lbs. 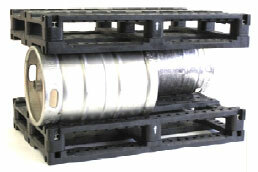 Note: Test for pallet deflection on loads over 2500 lbs. 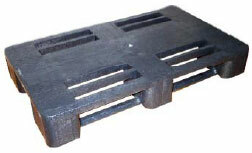 when used with unsupported (edge-supported) pallet rack.